Princess Jellyfish was a pretty cute anime overall. The animation was good, and the first couple of episodes were very strong and memorable. Unfortunately, the story gets bogged down by a needless political/romantic side plot that nobody asked for, and that took time away from the rest of the cast to really grow. The side characters ended up becoming pretty stagnant and the core romance was left completely unresolved by the end. Sadly, Princess Jellyfish wasn’t renewed for another season, and I honestly wish it was so that the main characters could have had more time devoted to their relationships and personal growth. I don’t know why it took me so long to finally watch this show, but I’m really glad I finally got around to finishing it because it’s great. The political intrigue is fascinating. The first episodes were excellent. The show perfectly balanced its comedy and intensity. The romance between Shion and Nezumi was very sweet, and the progression felt natural and genuine. There were some unresolved plot threads at the end, but overall I felt the show was well done and worth the time, and since I’ve heard the manga and novels resolve some of the issues I had with the anime, I’m excited to go read them at some point. Brotherhood serves as extra content for the Final Fantasy XV lore and characters, giving them good backstory. The animation is quite nice, and the action is chaotic and reflective of the video game too. The episodes were quite short, but told their stories well and were quite entertaining and memorable. Fans of the game will no doubt appreciate seeing more of the Chocobros in action, and I think it’s safe to say that Brotherhood achieves that goal. 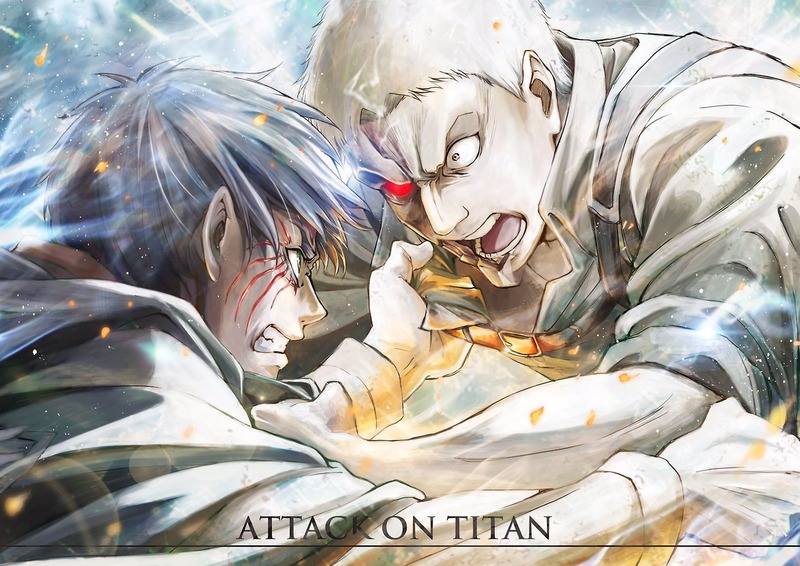 Season 2 of Attack on Titan was absolutely amazing. The animation is beautiful (even if the 3D Colossal Titan does look a little strange) , the action scenes were exciting (they gave me chills! ), the music was great, and the finale was epic and true to the manga. The tender moments between so many of the characters in the last episode (Eren and Mikasa in particular) is retained and done so well. Season 2 also made some bold decisions with adding some additional scenes that, in the manga, show up much later, and yet makes the placement of these new scenes very befitting to the themes and situations the characters face. This season was pretty much perfect in every way. While I’m disappointed that it had a smaller amount of episodes, the pacing was still incredibly well done. I thought it might feel rushed only being twelve episodes, but the story takes the time to unfold at a natural pace. Season 2 was certainly a step up for sure, and I can’t wait for Season 3. Studio Wit did a fantastic job.